The ranger at the entry station was experienced enough such that she specifically warned us off of two of the scenic overlooks due to difficulty in turning a rig our size around once we got in, at least if there were any other vehicles in the respective lots. Once again our annual pass covered the $10/vehicle entry fee. The park is visited by 600,000 people each year, but you sure would not have known it on our visit; even the most crowded points only had a dozen or so people and often we found ourselves alone on the overlooks and road. We even got to visit one of those two overlooks the ranger warned us about since no other vehicle blocked the turn around point. 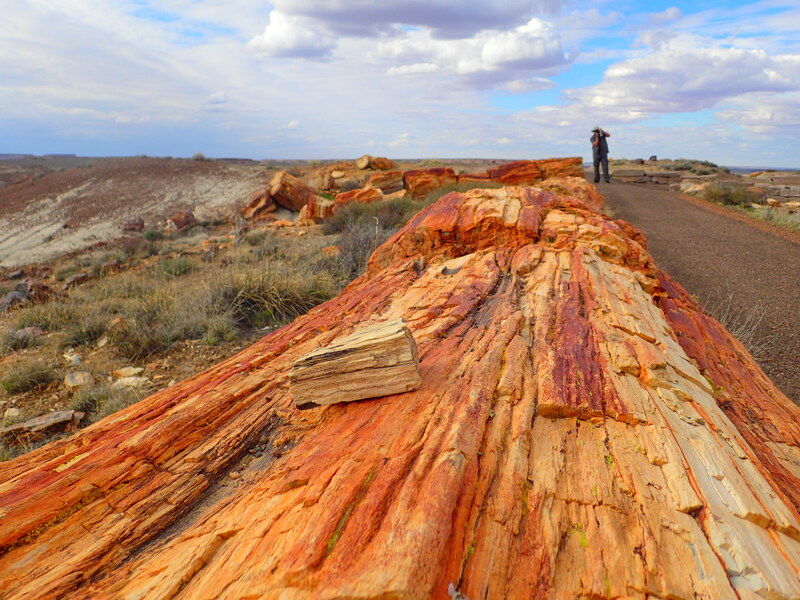 We started with the short hike near the visitor center, which took us through many of the largest specimens of petrified trees, some of them enormous by any tree standards, much less something still intact after 200 million years. 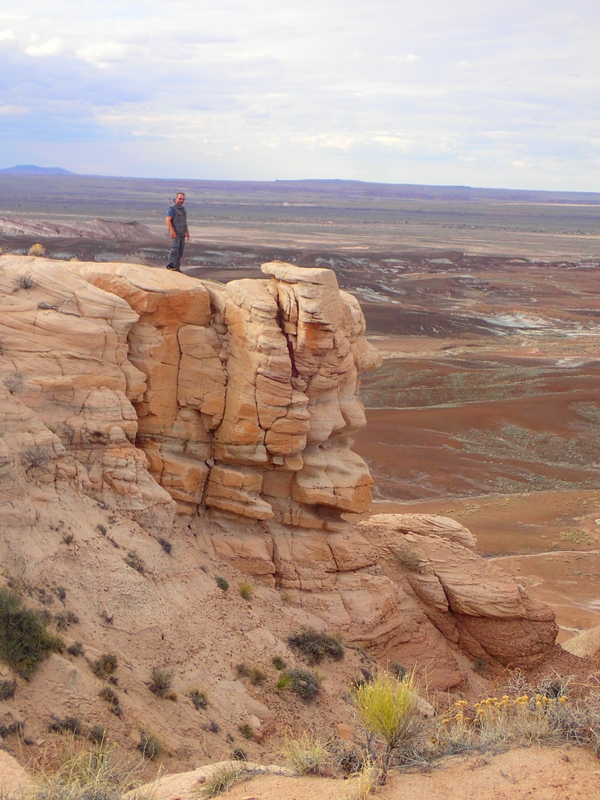 After this we took the Kahuna up the road and stopped at each station, some with short hiking trails, such as Blue Mesa, and some with just pull out overlooks such as Newspaper Rock, one of several large rock faces covered in petroglyphs from pre-Columbian Pueblo tribes. No railings. Ideal for unsupervised children. As the day grew short and temperatures dropped our stops at each site grew a bit shorter and more frantic, eager as we were to see everything. We abandoned our original plan of running the 26 mile road in both directions to stay at the little RV park right outside the southern park entrance. This decision allowed us to relax a bit and make it to every point of interest before dark. 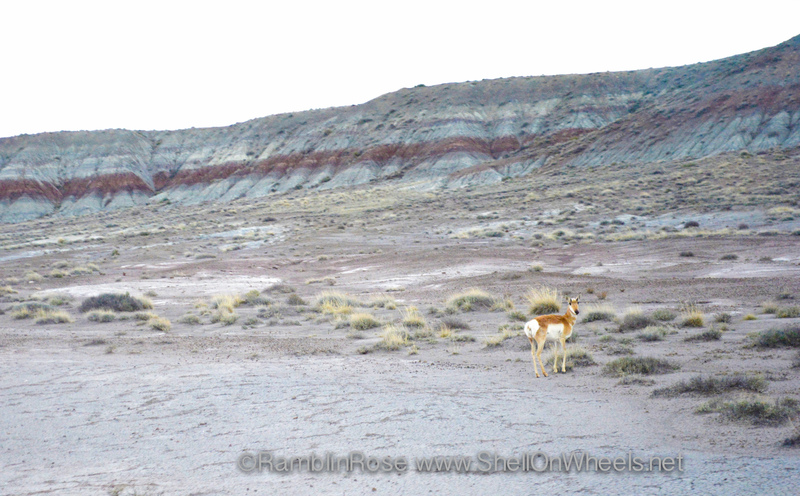 The geological overlooks and sites were indescribably fantastic, but the highlight of the run might have been the pronghorn that crossed our path near dusk. This is the fastest land animal in the western hemisphere, capable of 55 mph bursts. 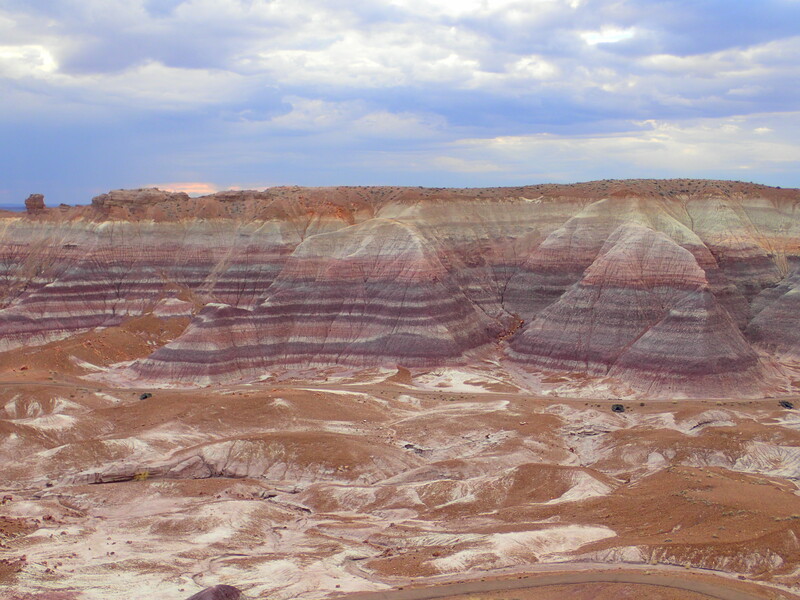 The park is bisected by I-40, and once across the overpass you enter the Painted Desert section. 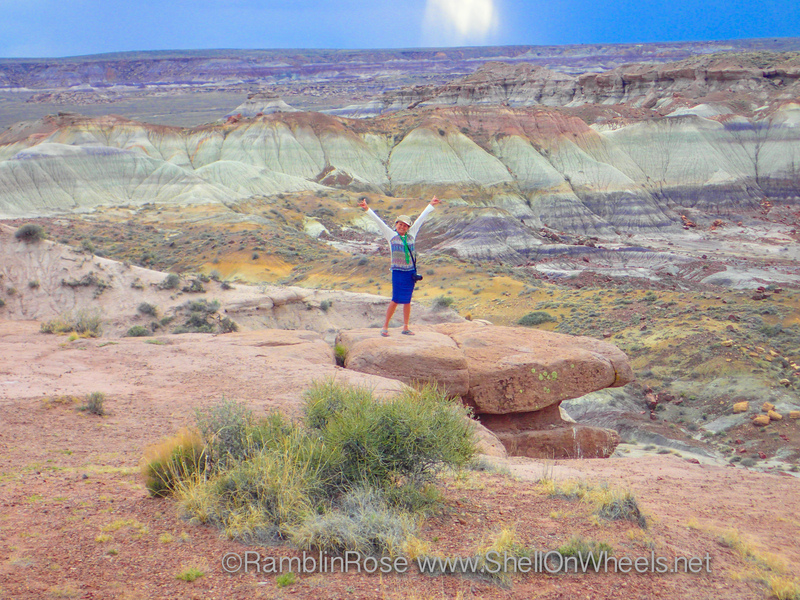 We thought we were done being astounded, but this aptly named area blew us away. Ever look at other people’s online photos and wonder how much they have been altered, particularly possible exaggeration of color? I don’t mean Kim Kardashian’s airbrushing or the extreme alterations to every single professional model to ever grace the cover of a magazine; I’m talking nature photos that seem just a bit too awesome to be real. 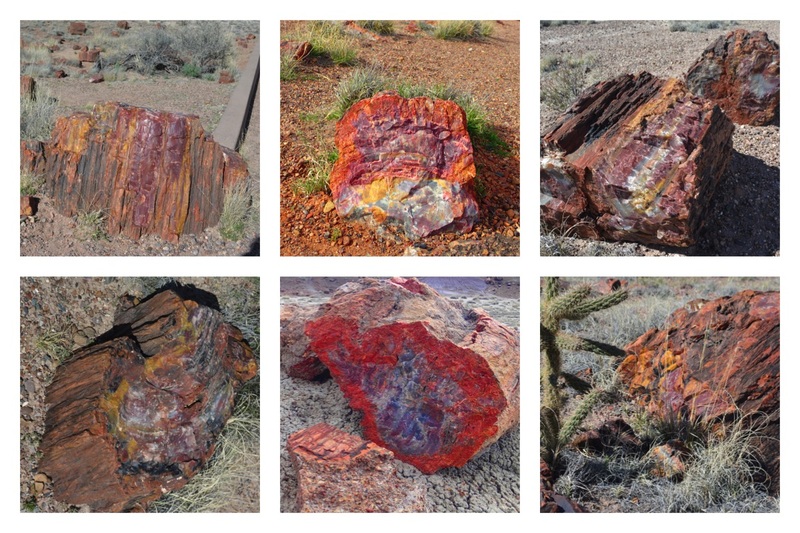 That is a healthy attitude to take about anything from the internet, but the Painted Desert might make you reassess your skepticism, as it really is that shockingly colorful. You can see videos of some of the impressive views on our facebook page. We finished the park at sunset, exhilarated but a bit concerned as we had no place to stay and it was getting dark. The Kahuna is many things, but a night ranger is not one of them; the headlights are particularly weak and he is stressful to drive after dark. 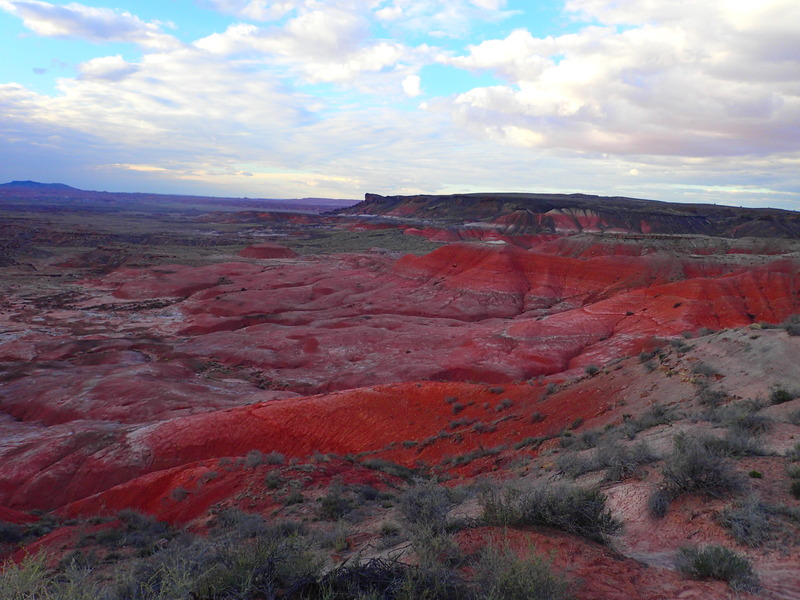 We had the choice of driving back south through the park to the known quantity of a very cheap (free or $10 for electricity only) park at the southern entrance, or heading west on I-40 towards Holbrook and find something on the way. The first option would take nearly an hour as the park road had us down in the 35 mph range for much of the trip. The second had the advantage of moving us closer towards our next destination, but was an unknown. Given how many parks exist along the interstates in this part of the country, we went with the latter choice, confident we would find something without difficulty. Sure enough, about 10 miles down the road we saw signs for Root 66 RV Park (no, that is not a typo, I suspect trademark issues effected their name choice.) We pulled in to this roadside, bare bones looking park and were pleasantly surprised to find very warm and friendly owners, full hook-ups (power/water/sewage), clean shower facilities, a choice of parking spots, free WiFi, and a Passport America rate of $16.50 a night. Sold! We did a quick hook up and celebrated St Patrick’s Day as best we could without access to cornbeef and cabbage.